Three second half goals by three different players gave the No. 7 University of Florida soccer team (2-0, 0-0 SEC) a 3-0 win over Florida International (1-1, 0-0 Sun Belt) Friday evening in front of a James G. Pressly Stadium crowd of 1,927. A FIU foul just at the top of the18-yard box led to the Gators’ first goal. Senior Angela Napolitano took the free kick. FIU goalkeeper Melanie Raimo got a hand on the ball but it continued to travel across the face of the goal where sophomore Lindsay Thompson headed it in at the far post corner for her first score of 2009. The final 11 minutes of the match saw the first collegiate goals scored by freshmen roommates Erika Tymrak and Brooke Thigpen. UF goalkeeper Katie Fraine turned in three saves. 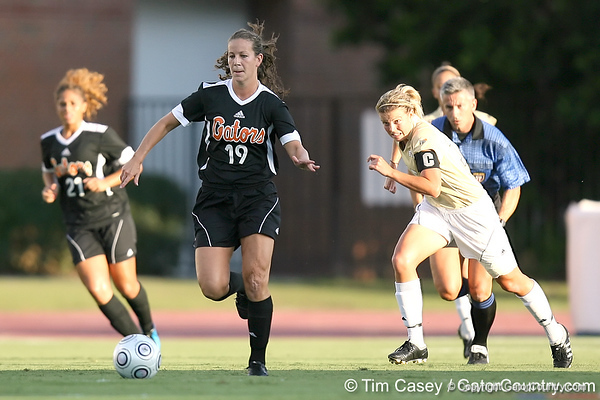 The Gators are in action again Sunday, Aug. 30 when USF (1-0, 0-0 Big East) comes to town. The Bulls were 1-0 winners over Florida Atlantic Friday evening in their season opener. Match time is set for 1 p.m. at Pressly Stadium.